Mayo head into the mid league break with six points in their back pocket following a five point win over Cavan in MacHale Park on Saturday night. James Horan’s men kept Cavan at arms length in the second half, having built up a three point lead at the end of the first half thanks to Evan Regan’s goal not long before the short whistle. James Horan made five changes to the team that started the previous weeks win over Tyrone in Omagh, with Westport’s Colm Moran making his league debut and Breaffy’s Matthew Ruane getting his first league start for the county. Also coming back into the side were the Ballina trio of Evan Regan, David Clarke and Ger Cafferkey who put in a man-of-the-match performance at full back for the side. Cavan started the game brightly and lead 0-4 to 0-1 after eight minutes thanks to a brace of Jack Brady frees, along with a long range placed ball from goalkeeper Raymond Galligan and a Dara McVeety effort from play inside the opening few seconds. Mayo’s early response came from an Andy Moran pointed mark and they pulled themselves level at four points each by the 16th minute thanks to Moran’s second point along with efforts from Fionn McDonagh who retained his place in the starting 15 after his man-of-the-match showing in Omagh and Jason Doherty free. 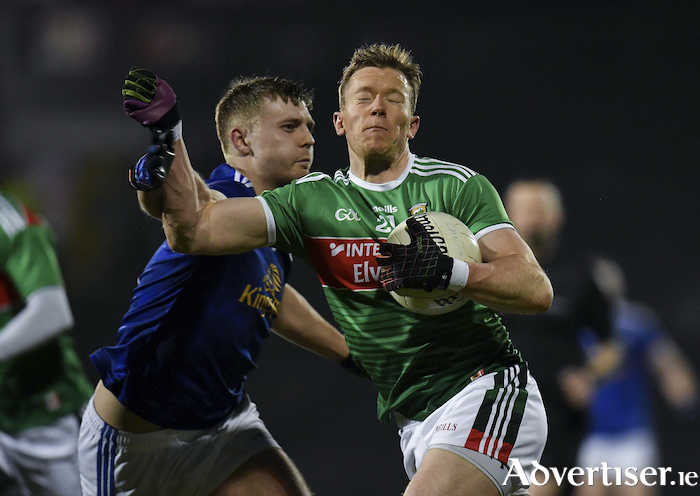 The next 15 minutes saw Mayo take control of the contest with and the were 0-7 to 0-5 in the lead with 33 minutes gone thanks to points from Regan, an Aidan O’Shea mark and Doherty’s second free - while Cavan replied from a Niall Murray effort. A minute before the end of normal time Cavan had the gap back to just one when Conor Rehill drove an effort over the bar, but Mayo were just about to get the momentum changer in the game. Matthew Ruane took a shot for a point - but the ball didn’t have the legs to get that far, it looked like Galligan had the ball under control, however Regan followed it in and was able to dislodge the ball from his grasp and it ended up in the back of the net. Cavan did hit back with another Rehill point just before the break to send Mayo in leading 1-7 to 0-7. The second half was a far less frantic affair and Mayo hit the first two scores of the terminal period through and Regan are and Lee Keegan point from well out the park. Cavan hit the next two scores though a Brady free and a McVeety effort from play - but they didn’t look like they had it in the legs to reel in Mayo. Donal Vaughan clipped over Mayo’s 10th point 11 minutes from time and scores from Brian Reape, Doherty and Diarmuid O’Connor rounded off the scoring for Mayo - with Conor Moynagh and Martin Reilly getting Cavan’s last two scores. Both sides saw out the closing stages of the contes with 14 men, with Mayo loosing Evan Regan to an injury late on and not bringing on a sub to replace him, while Cavan’s Stephen Murray picked up a second yellow card ten minutes from time.